Written by: Shafqat Javed on March 15, 2019. Once a year, Donald Trump gives an uncharacteristically bipartisan speech to Congress. It is customarily sandwiched — often within hours — by venomous expressions of partisanship. Mr Trump’s 2019 State of the Union was no exception. His first address to Congress, which took place shortly after his infamous “American Carnage” inaugural address in 2017, won rapturous reviews. Otherwise implacable critics said he had finally taken on a presidential mantle. Such praise was quick to curdle. Two years later, no one believes Mr Trump is about to pivot to the political centre. In spite of obligatory references to American greatness, moon landings, Normandy Beach invasions, and Cold War valour, Mr Trump’s only real goal was the highly divisive — and familiar — one of building a wall with Mexico. He, however, offered no plan on how to do it. Trump announced that his long-awaited second summit with North Korean leader Kim Jong-Un will be on February 27 and 28 in Vietnam as he pushes forward nuclear negotiations with Pyongyang. “As part of a bold new diplomacy, we continue our historic push for peace on the Korean Peninsula. Our hostages have come home, nuclear testing has stopped, and there has not been a missile launch in 15 months. If I had not been elected President of the United States, we would right now, in my opinion, be in a major war with North Korea with potentially millions of people killed. Much work remains to be done, but my relationship with Kim Jong-Un is a good one,” he said. For over two years, Trump has hounded US allies in NATO to spend more on defence, saying they are taking unfair advantage of the United States and even privately questioning whether the United States would stay in the alliance. In the SOTU, he took a more positive tone, saying the United States has secured over $100 billion in defence spending from allies. He said, “For years, the United States was being treated very unfairly by NATO – but now we have secured a $100 billion increase in defence spending from NATO allies.” Perhaps much to the relief of nervous European allies, his mention of NATO started and ended there. The president reiterated his decision to withdraw from the Cold War-era Intermediate-Range Nuclear Forces (INF) Treaty with Russia. Trump alluded to negotiating a new agreement, which would include China. The treaty withdrawal sparked fears of a new arms race. The president did little to ameliorate the concerns, vowing to “outspend” and “out-innovate” other nations. “While we followed the agreement to the letter, Russia repeatedly violated its terms. That is why I announced that the United States is officially withdrawing from the Intermediate-Range Nuclear Forces Treaty, or INF Treaty. Perhaps we can negotiate a different agreement, adding China and others, or perhaps we can’t – in which case, we will outspend and out-innovate all others by far,” he said. Continuing the theme of withdrawal, Trump thanked US troops for their service in Afghanistan and said that the time had now come for a political solution to the problem. “In Afghanistan, my administration is holding constructive talks with a number of Afghan groups, including the Taliban. As we make progress in these negotiations, we will be able to reduce our troops’ presence and focus on counter-terrorism; and we will indeed focus on counter-terrorism. We do not know whether we will achieve an agreement but we do know that after two decades of war, the hour has come to at least try for peace. The other side would like to do the same thing. It’s time,” he said. It needs to be remembered here that following the president’s announcement in December 2018 of plans to withdraw US troops, the United States met with representatives of the Taliban for peace talks. The Taliban now control more territory than at any time since the US invasion of 2001 and are estimated to have some 60,000 fighters. What Trump did not mention? Trump is a noted climate change doubter who withdrew the United States from the 2015 Paris Climate Accords, and so it’s no surprise that he was silent on the issue. But the overwhelming scientific evidence of climate change continues to pile up, and with it predictions of disastrous consequences around the globe. A US government report released in November 2018 – one the Trump administration ignored – warned that the US economy could lose thousands of lives and hundreds of billions of dollars by the end of the century from the impacts of climate change, including extreme weather. From the start of his presidency, Trump vowed to secure what he calls the “ultimate deal” between Israel and the Palestinians, where generations of US leaders and diplomats have failed. But more than two years into his presidency, Trump and his son-in-law, Jared Kushner – the point man on negotiations – have remained tight-lipped about what their plan entails. The rollout of the plan has reportedly been delayed again until after Israeli elections in April. While Trump touted certain countries’ aspirations for freedom in his address, notably Venezuela’s, he made no reference to the troubling backslide of democracy worldwide. The nonprofit group Freedom House concluded recently that there has been a steady decline in political freedom and civil liberties worldwide for over a decade. Trump spoke of China and North Korea, on Mexico and Venezuela, of Europeans and Russia, and the Middle East and Afghanistan. But he made no mention, at all, of Africa, the home of some of the world’s fastest-growing countries and economies; nearly one-sixth of the world’s population; several of the world’s worst humanitarian crises; and a growing number of US military showdowns against militant groups. On foreign policy, the SOTU was classic Donald Trump. There were the usual expansive promises which could actually move American foreign policy in a better direction. The president promised to withdraw troops from Syria, open negotiations with the Taliban in Afghanistan, and praised the growth in spending by NATO allies. He even criticized America’s excessive military intervention in the Middle East. And as always, his speech had an underlying theme: blame my predecessor, not me. As he describes, his photo opportunity summits with North Korea are a good step towards diplomacy. But we can’t forget that it was his aggressive approach to the problem that brought USA so close to conflict in the first place. It’s likewise difficult to take his criticism of America’s wars seriously given his administration’s choice to increase troop levels in the Middle East by over 33 percent. As with every Trump foreign policy speech, there were also some worrying trends. He specified no time-line for troop withdrawals from Syria or Afghanistan, leaving open the possibility that advisors can stall or prevent the decision from ever being implemented. He praised America’s withdrawal from arms control agreements, but offered no alternative, suggesting instead that the United States will just “outspend” all its competitors. The president also talked tough on both Venezuela and Iran, continuing his hard-line approach to those crises. In both cases, the administration has refused to rule out military intervention, and has repeatedly raised the stakes with draconian sanctions, and open saber-rattling. It remains a mystery why Donald Trump, whose instincts appear to be generally correct on Afghanistan and Syria, is so willing to entertain military intervention in Iran or Venezuela. In short, the SOTU offered no real surprises in foreign policy. If Trump administration does follow through on withdrawing troops from Syria, and ultimately from Afghanistan, it will constitute a major – and positive – shift in US foreign policy. But you shouldn’t hold your breath. The odds are good that Trump may again backpedal on these promises, while maintaining his more bellicose line towards other conflicts. President Trump also discussed his administration’s sweeping changes in trade policy, including the renegotiation of the North American Free Trade Agreement, the new tariffs imposed on foreign aluminum and steel, and the growing trade war with China. 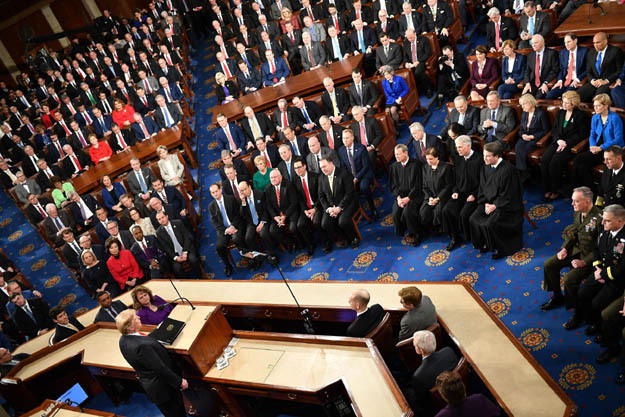 The State of the Union address is a speech delivered annually by the President of the United States to a joint session of the United States Congress. The State of the Union address is not, however, delivered during the first year of a new president’s first term in office. In the address, the president typically reports on the general condition of the nation in the areas of domestic and foreign policy issues and outlines his or her legislative platform and national priorities. George Washington was the first to give an annual speech to a joint session of Congress, beginning in 1790. For more than a hundred years, presidents delivered a written report that was read out by a clerk. In 1913, Woodrow Wilson re-established the practice of a speech in Congress, and since then every president except Herbert Hoover has given at least one address. Warren Harding’s address in 1922 was the first to be broadcast on radio and Harry Truman’s was the first to be televised in 1947. The name “State of the Union” first emerged in 1934 when Franklin Roosevelt used the phrase, and it later became the generally accepted term. Before then it was called “the President’s Annual Message to Congress”. This post has been seen 172 times.